What Does My Company Gain From Sponsorship? Contribution to $10,000 in donations for non-profit organizations in Guelph and Wellington County. 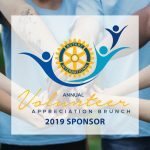 Support The Volunteer Appreciation Brunch Through Canada Helps! Are There Other Ways To Support This Event? You can use your company or personal social media to promote this event to our community. Your promotion will help us to recognize and thank 100 volunteers in Guelph and Wellington County. Request a social media promotion kit today! Could your business donate a draw prize or an item for 100 volunteer gift bags? Thank you for supporting our sponsors in the Guelph and Wellington County community.